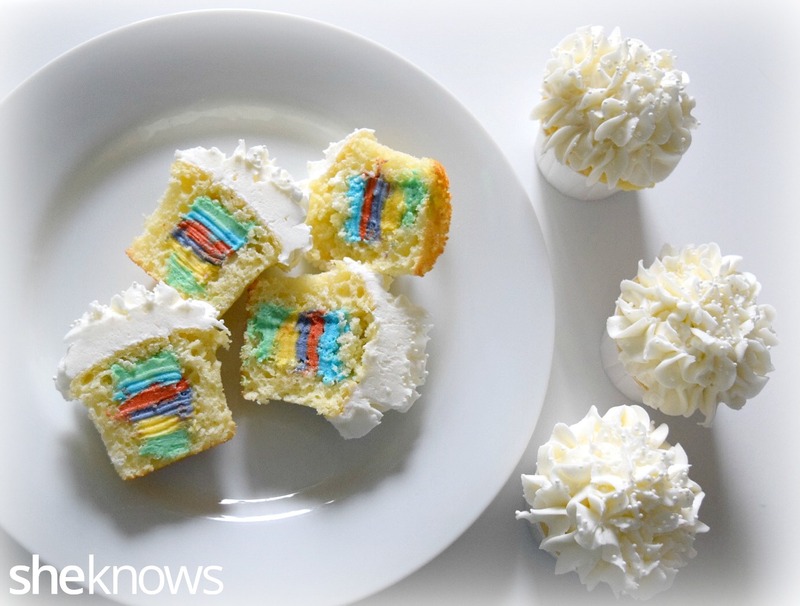 These white vanilla cupcakes will surprise everyone with their colorful rainbow filling inside. I love anything rainbow. I smile every time I see things in rainbow colors, and rainbow food is even better. These cupcakes will trick you too. They seem all plain white and boring, right? But when you bite or cut inside and see the rainbow, you just have to grin from ear to ear. 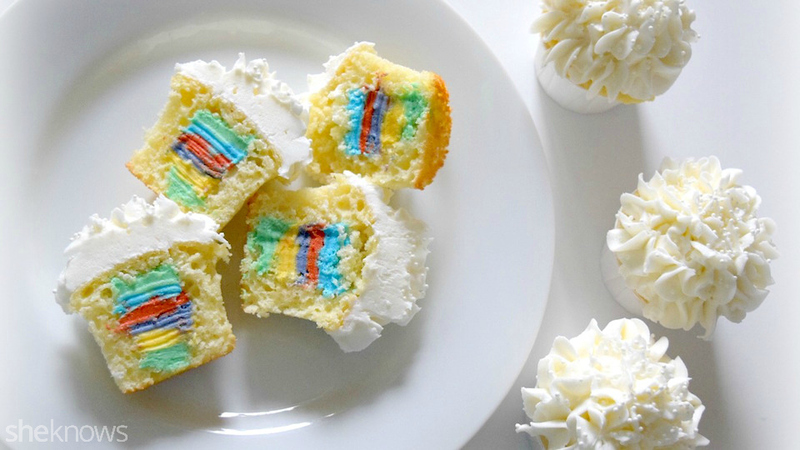 It’s pretty simple to get this effect too by removing the center of the cupcake and then filling the hole with your rainbow layers of frosting, adding 1 color at a time. You could also just put the rainbow colors on top of the cupcakes too. Both ways are pretty special in their own way, as you can see. You can use your favorite white cake or vanilla cupcake recipe, or use a boxed mix and canned frosting to save time. 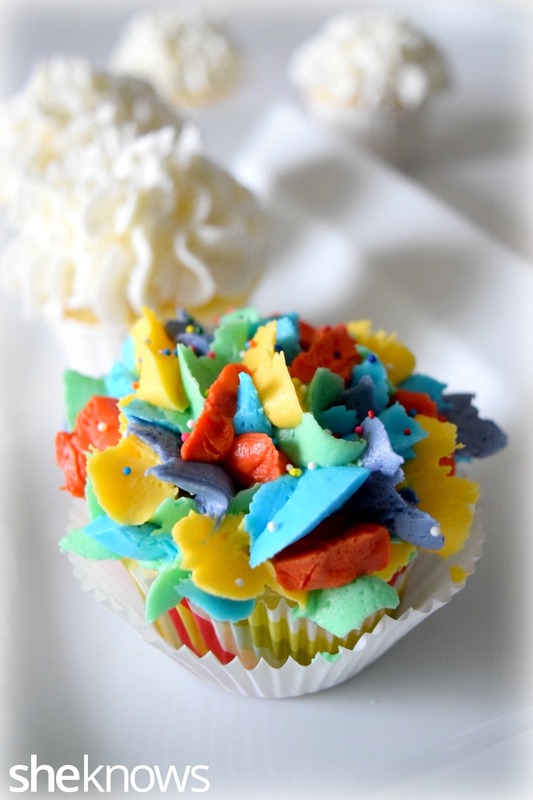 If you forgo the rainbow icing inside, you can just pipe the colors on top with your favorite icing tip. Mix the cake batter per the directions on the box. Bake the cupcakes in white or neutral-colored liners. To make the buttercream frosting, beat together the shortening and the butter until well mixed. Add the vanilla. Add the sugar 1 cup at a time until combined. Add the milk as needed until the buttercream frosting is light and fluffy. Add about 3/4 cup of the frosting to 5 separate zip-lock freezer bags. Tint each bag of frosting with a different food gel color. 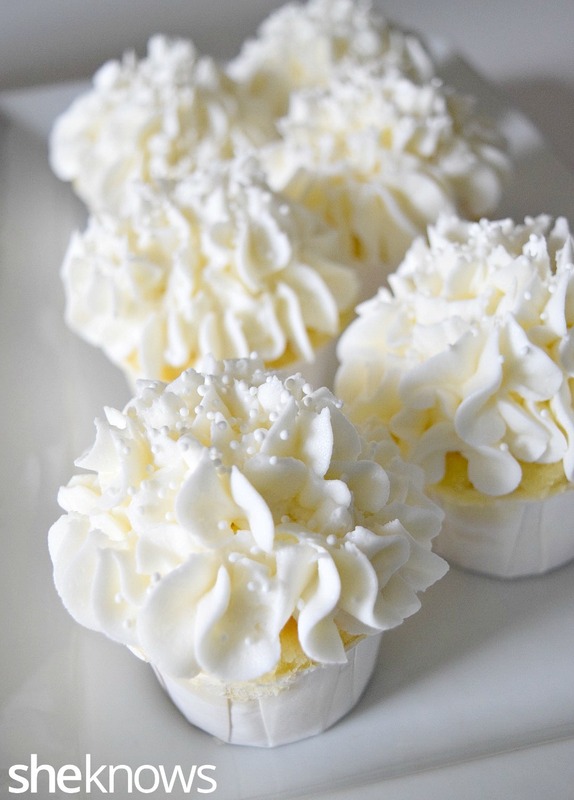 Using a knife, cut out the center of each cupcake (save the tops!). 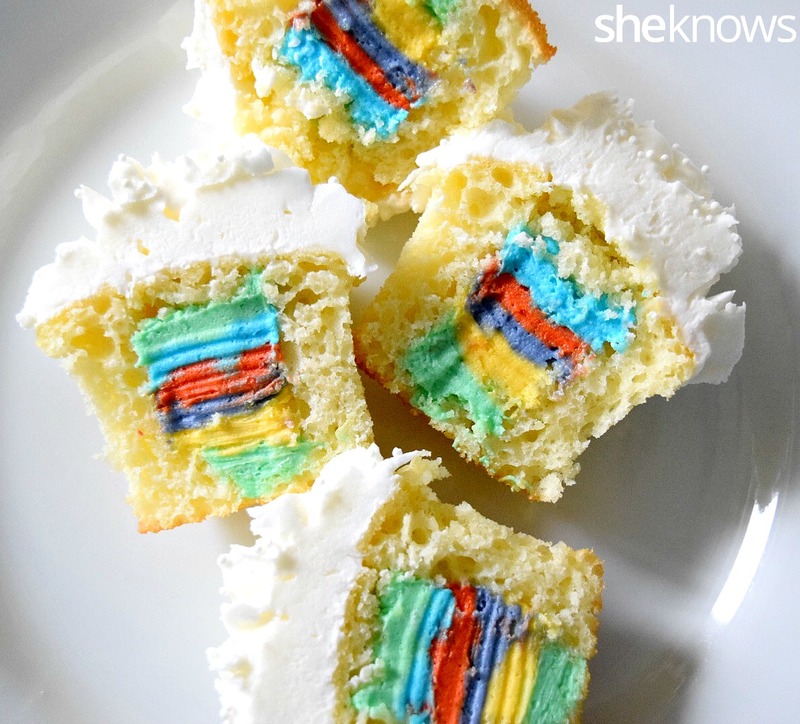 Snip off an end of the zip-lock bag, and fill the hole in the cupcake with each rainbow color in layers. 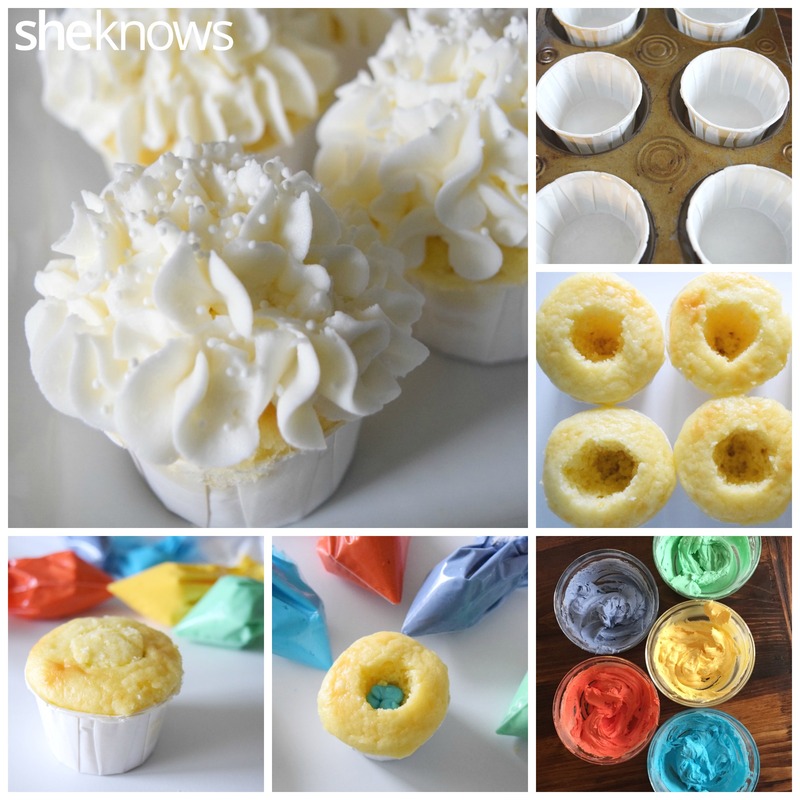 Tap the cupcake after each color to ensure each buttercream layer is packed down. Top the filled cupcake with a piece of the cupcake scraps you removed. Frost the cupcake with the white buttercream to finish.